Tokyo is HUGE. Between navigating the railway system to brushing up on Japanese customs, figuring out the best way to visit the city can be a challenge. 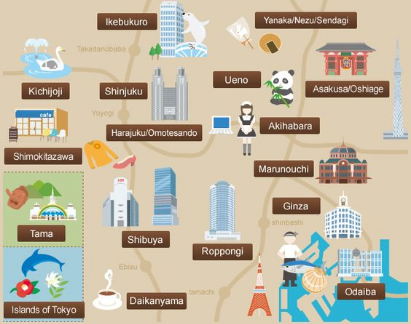 To help you feel less clueless and more like a Tokyo pro, we Journyists have compiled a basic list of must-know tips when visiting Japan's largest city. We've got you covered on getting around, important cultural traditions, where to visit and what to eat while you're there. Narita International Airport: Most international flights arrive and depart from Narita International Airport, which is located 60 km from central Tokyo. The fastest and easiest way to travel to central Tokyo from Narita is by Japan Rail, more commonly referred to as the JR. The fastest option is to take the Narita Airport Express (NEX) — included if you buy a JR Pass — more on that below, which takes about an hour. You can also take the Keisei Railways train from Narita to connect with the JR Yamanote Line, which can connect you to any part of central Tokyo, which, takes about an hour and 40 minutes, and costs slightly less than buying a ticket on the Narita Airport Express. Tokyo Haneda Airport: Some international flights land in Haneda, but it mostly handles domestic flights. If you are taking a flight out of Haneda, you can take the Tokyo Monorail to connect with the JR Yamanote line to travel between the airport and central Tokyo. Taxis: Taxis are quite expensive in Japan. Fares start at approximately $7 and go up very quickly. It's actually not that expensive compared to an NYC taxi, but Tokyo is very large and spread out so a cab from Ginza to Shibuya will run you about 2500 yen (a bit under $25). 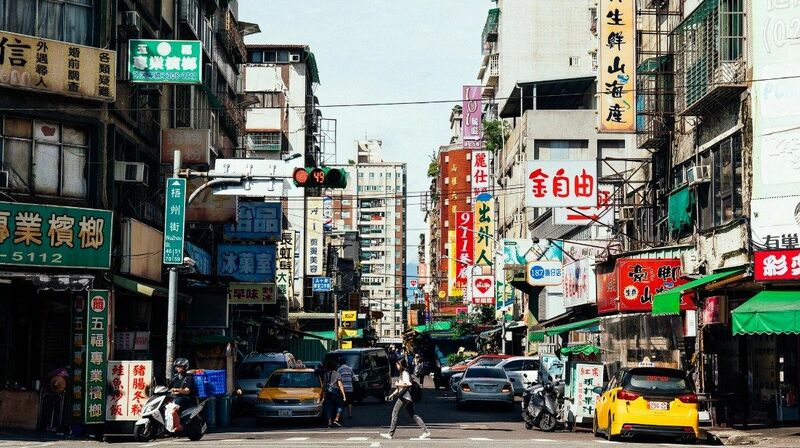 It might be appealing to hop into a taxi, but your best bet is to take public transportation as it is ubiquitous, comfortable, and unbelievably clean. Trains and Subways: Subway and train lines are operated by several different companies. The “JR Yamanote Line” is the main train loop that most tourists will use in central Tokyo. Suica or Pasmo cards are the public transit cards for every line. They’re touch pad, meaning you do not need to take them out of your wallet, just tap and go (Tip: during rush hour, don’t slow down and block the entrance—you will annoy people. Quickly tap and walk through). The cards are refundable with a 500 yen deposit. Cost is determined by distance, not by single entrance, so the further you go, the more the cost of the ride (if buying single ride, which is not recommended, be sure to select the correct destination). Not every machine sells Suica / Pasmo cards, but every machine does allow you to top up your card. Look for the Suica logo (we saw Suica more often than Pasmo but the two cards function the same), and purchase a card. 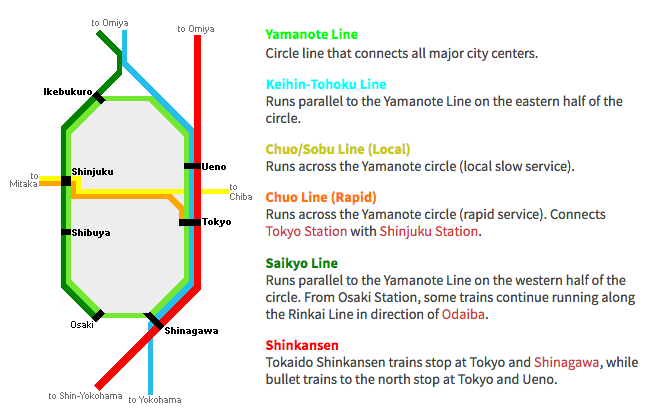 Rail system: There is a difference between JR (Japan Rail) train lines and other subway lines (usually under ground). They are on separate maps. You can typically transfer from subway lines to JR trains at the same location, however, you will need to exit the subway station to enter the JR station and vice versa. You can use your Suica card for both JR and Subway lines. If you are traveling between Tokyo and Kyoto, it absolutely makes sense to get a Japan Rail Pass (if you factor in the cost of getting from Tokyo to Narita and back, and then Tokyo to Kyoto and back, you more than save by getting the JR Pass). P.S. the Suica card works for the subway in Kyoto and Osaka too. IMPORTANT: You need to buy BEFORE you arrive via www.jrpass.com. If you buy a JR Pass, you will also be able to reserve the fast shinkansen (bullet) trains. You can learn all about reserving and riding the shinkansen trains from this Japan-Guide article. When you want to activate your JR Pass, head to a JR Exchange office (the main train stations — Ginza, Shinagawa, Shinjuku — all have them) to activate your pass. During most of the year, you don't need a seat reservation as the trains are relatively empty and you can just show your pass and get on the train. However, if you're traveling during the holidays in Japan, especially around New Year's, be sure to reserve seats in advance at the ticketing offices with your JR Passes, or you'll have to stand the full 3 hour train ride from Tokyo to Kyoto. 1) The machines take CASH ONLY. 2) Opt for the "My Suica" option which lets you put your name on the card. In case you lose it, you can get it replaced (you'll lose the 500 yen deposit for the card, but they'll reinstate whatever balance you had on it and transfer it to a new card). Full instructions with pictures via The Japan Guy. There are women-only subway cars. Please avoid these cars if you are not a woman. Speak quietly on the subway! It’s considered impolite to be speaking in English or any language really loudly. It’s seen as obnoxious and rude. Streets are not logical and hard to navigate. Having a data plan while traveling in Japan is ideal (Tip: right before leaving the airport, rent the portable wifi ~$10/day). Otherwise, download an offline version of the map area of Tokyo. Traffic patterns are: walk on the left, drive on the left. Don’t jaywalk! Even if there are absolutely no cars. You could get a ticket, but at the very least will receive a warning from a traffic officer. IMPORTANT: Google Maps is not always right in Japan. In many places we visited, we typically had to ask a local establishment how to find the place we were looking for, which was sometimes around the corner or down the street from where Google Maps said it was. Once you know how to ask, it's very easy as if the location is close, the person helping you will walk you to the door (really). Because of that, it's important to understand how Japanese addresses work when asking for directions or telling a taxi where you want to go. The 〒104-0061 is the zip code. 銀座 (Ginza in English) is the neighborhood, ５丁目 is the "chome" (pronounced "chou-meh"), which is the subdivision of the ward / neighborhood that it is in, while the 4 is the block number and the 15 is the building number. Taxi drivers will ask which chome (nan chome) a place is on and generally if you show them the 3 numbers (5-4-15 in this case) with the neighborhood Ginza, they will understand. Also, many places in Tokyo are located in larger buildings, so be sure to pay close attention to what floor the place is on. The outside of the buildings have signs that show what businesses exist inside. This can feel like a bit of a manhunt as some places have signs only with the Japanese characters, so make sure you give yourself extra time to find places if you have a reservation (as mentioned earlier, being late to a reservation is considered very rude, but missing a reservation or cancelling last minute is much worse as restaurants are very small and that means they lose out on revenue for the evening). The key phrase to know — "Kore wa doko desuka?" (Ko-le wa doko des-ka)? means "Where is this?" and then you can point to the address you're looking at. Tattoos are taboo as they are associated with the Yakuza (the Japanese mafia). Most saunas / spas / pools won't let you in if you have them (though in recent years, a number of onsens and bath houses have been culturally progressive enough to distinguish between Yakuza / gang tattoos and Western tattoos — always ask first to clarify). If you are trying to go to an onsen that does not allow tattoos, you can wear a shirt in the onsen to keep covered. Keep in mind, it’s not unusual to be asked to leave an establishment if they are visible. Wi-Fi is RARE. Coffee shops usually will not have WiFi. Even Starbucks. Clear umbrellas are the only umbrellas used in Japan (ok, 90% of the time). Not showing up or showing up late for a restaurant reservation is a NO-NOand simply not done. In recent years, many restaurants have refused to give reservations to foreigners for this reason, which is why reserving restaurants in Japan can be very difficult unless you're staying at a 5-star hotel. (You not only need to speak Japanese, but also call from a Japanese phone number and oftentimes have a Japanese credit card to hold the reservation — Journy can help here though — just submit your trip request at www.gojourny.com and we'll take care of your whole trip). People generally do not speak English, but they are friendly and willing to help. Google Translate has made huge improvements, and you can type in English, translate it to Japanese, and have the person you're speaking with speak into the phone in Japanese and have it translated in English text. If you are entering someone’s house or a traditional restaurant, shoes should be removed. Japanese people bow, rather than shake hands. It's rude to leave the counter without finishing your bowl of ramen. Many places will ask if you want a Small, Medium, or Large portion of noodles. Be careful what you answer as you'll be expected to finish the whole thing. In Tokyo, people stand on the left on escalators and pass on the right. Even if there is no one else in sight on the escalator, you may be scolded by standing on the right so remember to keep to the left! In Kyoto and Osaka, confusingly, people will stand on the right and pass on the left. When finishing a meal, it is custom to say "Gochisousama Deshita" (Gochi-sou-same Desh-ta), which means, "Thank you for a lovely meal." It's something that you'll notice locals saying as well, and chefs appreciate the effort immensely. You can also say "Itadakimasu" at the start of a meal, which means "I humbly receive this meal." However, fewer people do this today in restaurants (if you're in someone's home, we highly advise you to say this phrase to be polite). Most places in Japan only accept cash — cash is king and credit cards are rare. Most ATMs won't work with foreign cards, but the ATMs inside 7-Eleven convenience stores around the city are a reliable and ubiquitous option. No tipping required! Tipping is not customary. If you try to tip, people will either politely refuse or be confused and think you forgot your money. Finish your bowl of ramen/rice before leaving a restaurant—it's considered rude if you don't. Don’t walk around eating and drinking (trash cans are few and far between on the streets). Small bowls should be lifted up to drink, but not larger bowls. In many ramen & donburi (rice bowl) places, you must first pay and order from a meal ticket machine either in the entrance or right outside the restaurant. Then, you bring the ticket to the counter or the waitress and the food will be made for you. When using a vending machine, put money in FIRST, and then you will see options light up depending on the amount you put in. For example, if you put in 1000 yen and there's a ramen bowl for 1250 yen, the light for that bowl of ramen won't light up for you to select it until you put in 1250 yen more. Many places in Japan require reservations or patience as you wait in line, even for small meals. Lunch at restaurants is much cheaper than dinner, often for the same food. Many places don't have English menus. 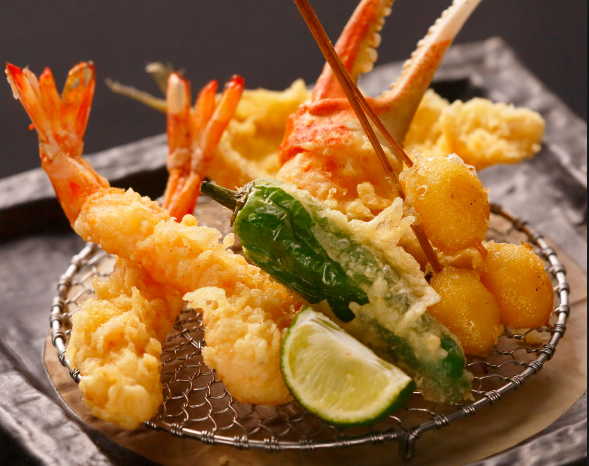 If you're adventurous, just say, "Osusume kudasai" (oh-susume kudasai), which means "Recommend for me please" and they'll start sending you dishes. Chefs will also check to see if you're full before sending out more food. You're going to want to try ALL of these. You've probably heard of many of these items before, but just in case you haven't, read on. 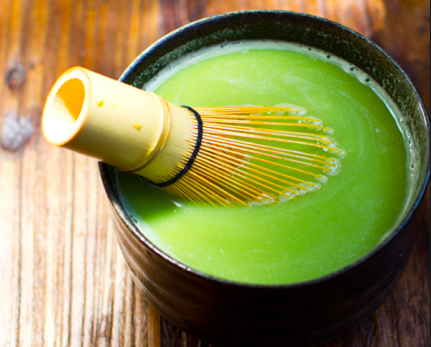 Matcha: finely ground, specially grown green tea. 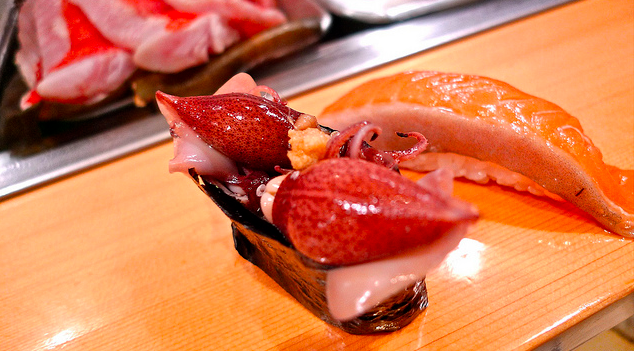 Sushi: raw fish served in omakase (what the chef chooses for you). 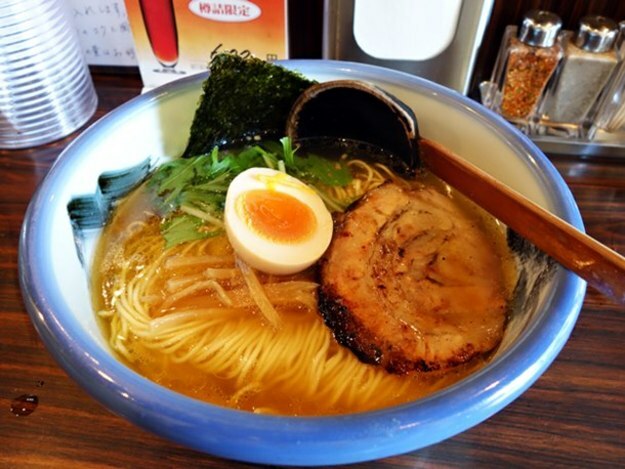 Ramen: noodles in soup or with dipping sauce (Tokyo is famous for tsukemen — a wavy, thicker ramen noodle served cold with a hot dipping broth). 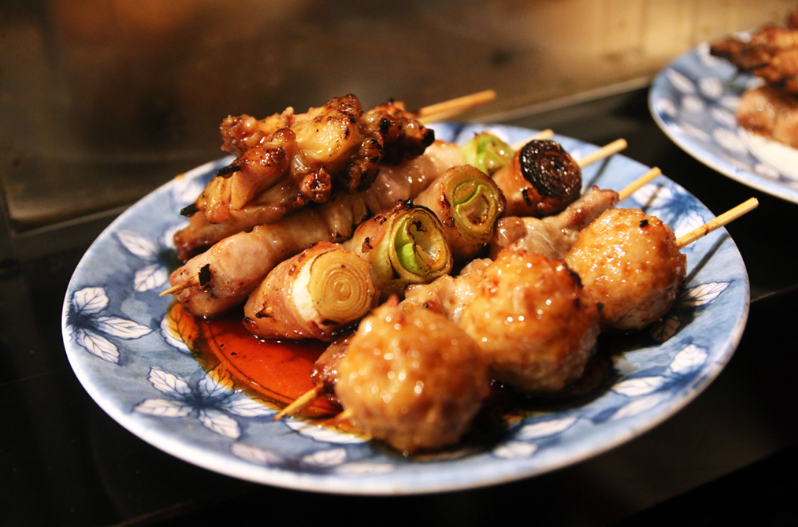 Yakitori: grilled skewers of meat and/or veggies. 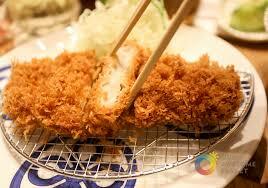 Tonkatsu: breaded, deep-fried pork cutlet. 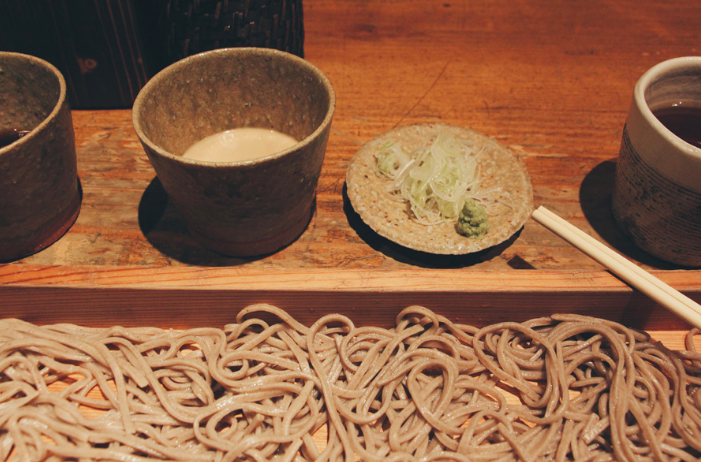 Soba: buckwheat noodles, eaten both hot and cold, with or without sauce. 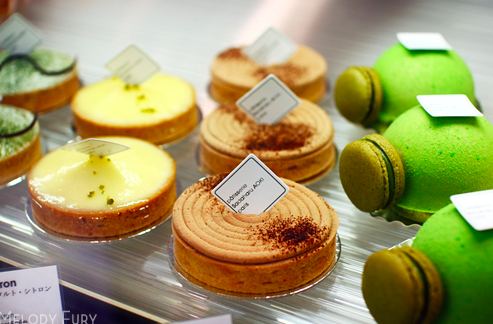 Japanese Sweets: delicate pastries with classic Japanese flavors like matcha and yuzu. 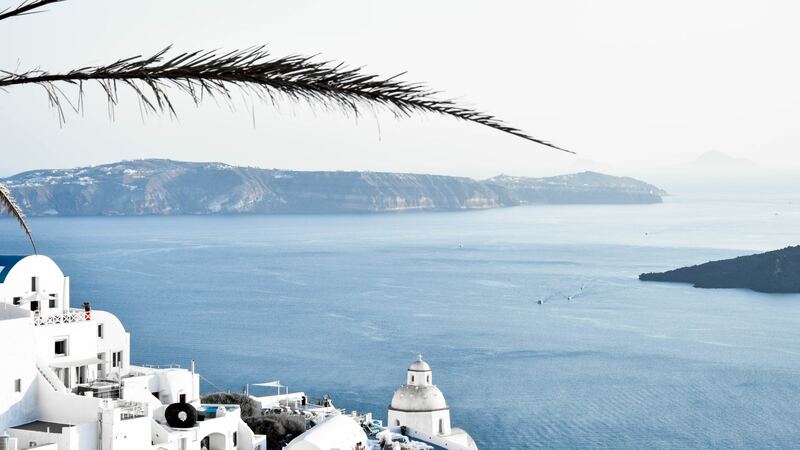 Work with your Journy travel concierge to discover the best places to enjoy each of these. 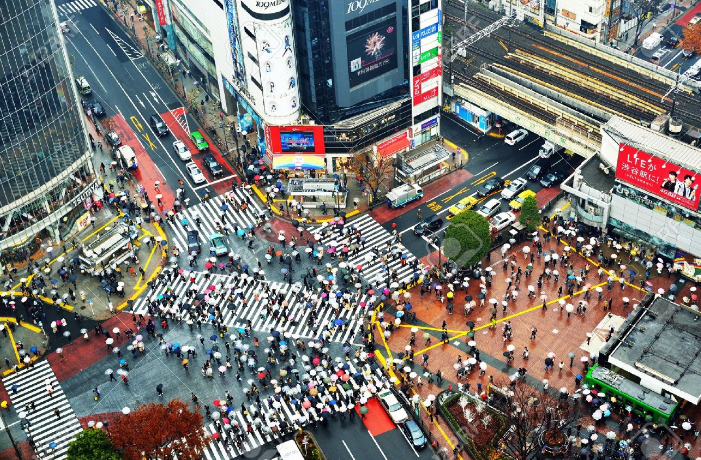 Shibuya Crossing: Tokyo's famous 5-way crossing. 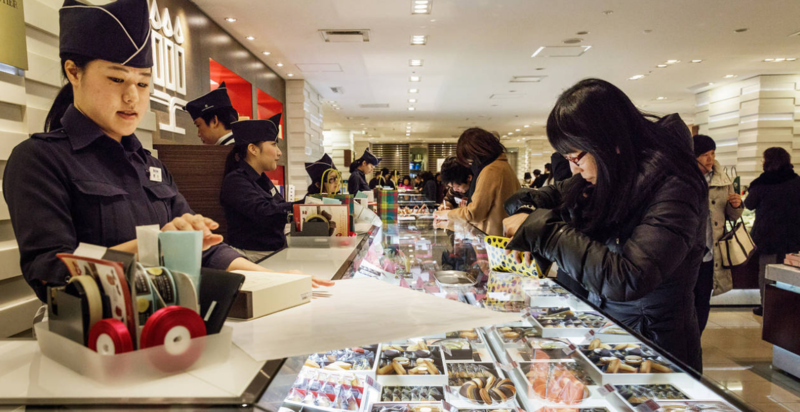 Depachika: food halls located in the basements of department stores in Japan. 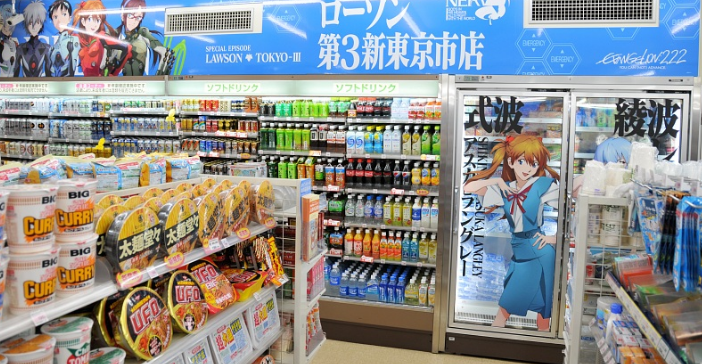 Convenience Stores: This may seem unremarkable, but convenience stores in Tokyo have a delicious and abundant food and snack selection. Tsukiji Fish Market: The most famous fish market in the world, where the world's majority of fish and seafood is bought and sold. 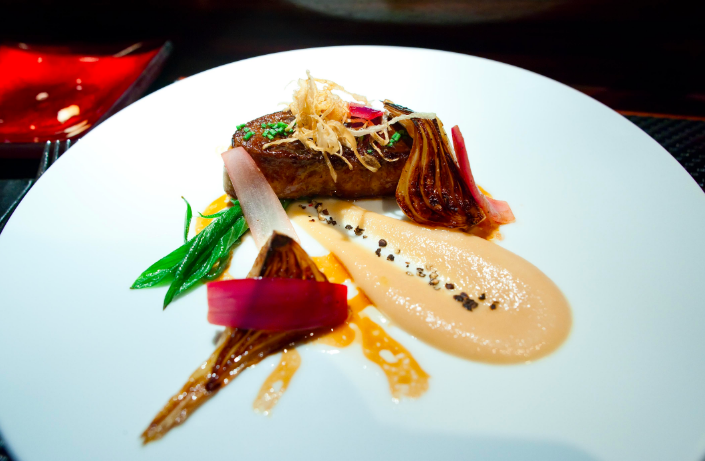 High-End Food Culture: Tokyo has the most Michelin-starred restaurants in the world. Pop Culture: Tokyo is filled with otakus, who is someone who is obsessed with computers, manga, or pop culture and bizarre cafes (like owl cafes). Fashion: High fashion and large department stores are extremely popular in Tokyo, especially in Shibuya. Shibuya: This district is a mix of cutting-edge fashion types and beloved, old-school Tokyo landmarks. The Meiji Shrine, Yoyogi Park, and the trendy Harajuku neighborhood are all within Shibuya's bounds. Harajuku/Omotesando: This is where you'll find the most outrageous fashion on both ends of the price spectrum. 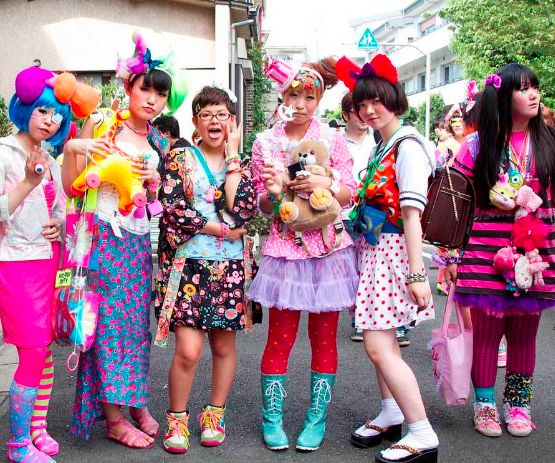 Harajuku tends to be more youthful, and therefore less expensive, while Omotesando is known for its high-end boutiques. 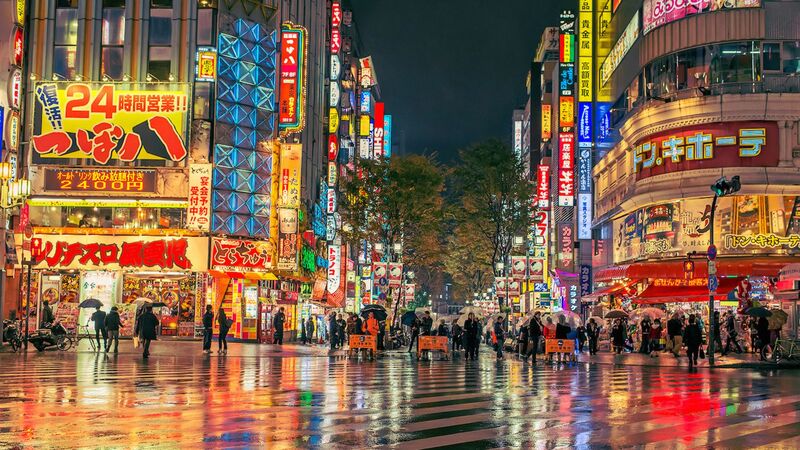 Shinjuku: The Shinjuku district is all about flashing lights and fun. This fast paced neighborhood contains Tokyo's Koreatown, but also features Shinjuku Gyoen, one of the best green spaces in the city. It's also home to late night bars and clubs as it contains Kabuki-cho, the former red-light district turned entertainment district. 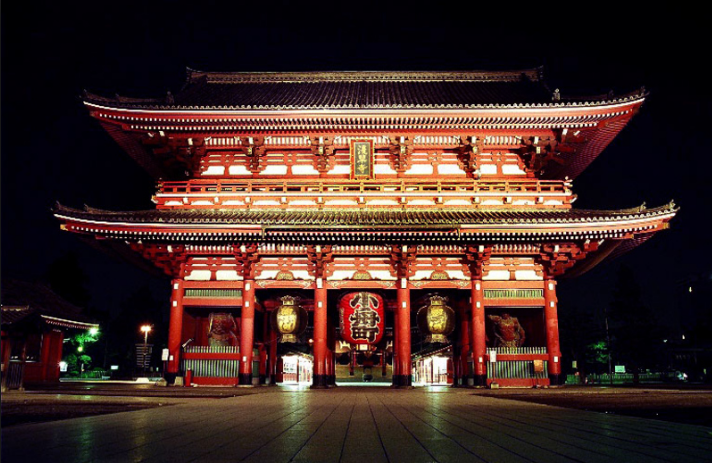 Asakusa: This is the neighborhood to seek out of you want to check out a bunch of the city's temples. Asakusa has an old school feel and is a great place to take a few hours to wander around. Ginza: Up-market fashion and shopping central. Ginza is Tokyo's most expensive area. 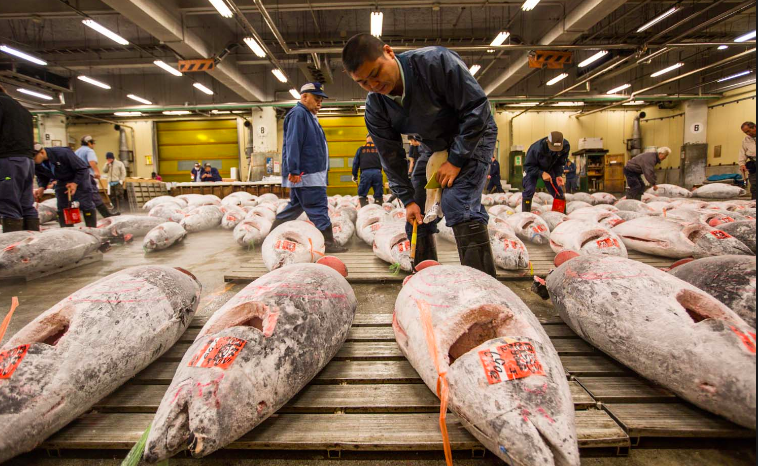 Tsukiji Fish Market: The famous Tokyo fish market is a neighborhood in itself. Go visit early in the morning to see all the best activity and then go for sushi afterwards. Akihabara: Tokyo's tech capital. If you're looking to pick up something specific, or just want to marvel at the expanse of tech and appliance stores, head to Akihabara. Roppongi: Home to some of Tokyo's wealthiest residents and the central hub of Tokyo nightlife. Roppongi is also where you'll find a large expat community. Shimokitazawa: This is the hipster neighborhood of the city. Think of it as the Williamsburg of Tokyo. Now that you have some basic tips on what to do while you're in Tokyo, here are a few things to know before you go. Pack light. Space is tight in apartments and hotel rooms, and there are often a lot of stairs to climb when you’re getting to and from your destination in Tokyo. Be sure to pack plenty of socks and comfortable shoes. 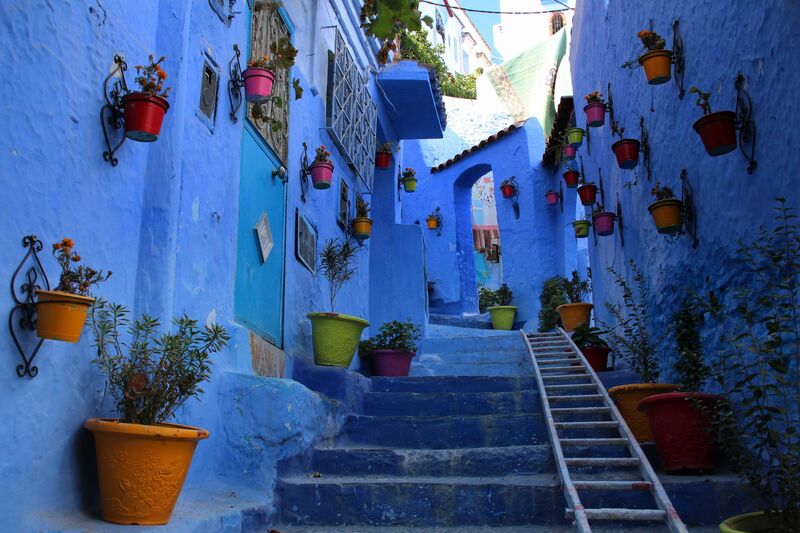 You’ll definitely be taking your shoes off at some point if you plan to visit any temples or traditional restaurants, and you’ll want your socks or hose to be presentable when you do so. Bring an electrical converter that converts your portable electronics from 220/240 to 110 volts. Casual clothing is fine for sightseeing, but more smart, conservative dress is appropriate for any nice restaurants you’ll attend. Be aware of the seasons! Tokyo tends to have true seasons, so never assume they’ll have a mild winter or summer. Pack plenty of layers to ensure you’re most comfortable. Pack a mini towel to carry around with you, since paper towels or hand towels are scarce in public restrooms. 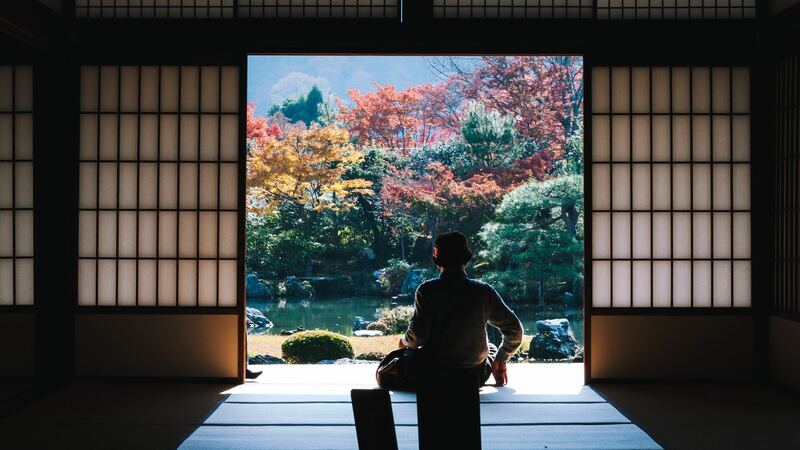 Traveling to Japan can seem a bit scary and daunting at first, but it's incredibly worth the effort to plan a trip there. 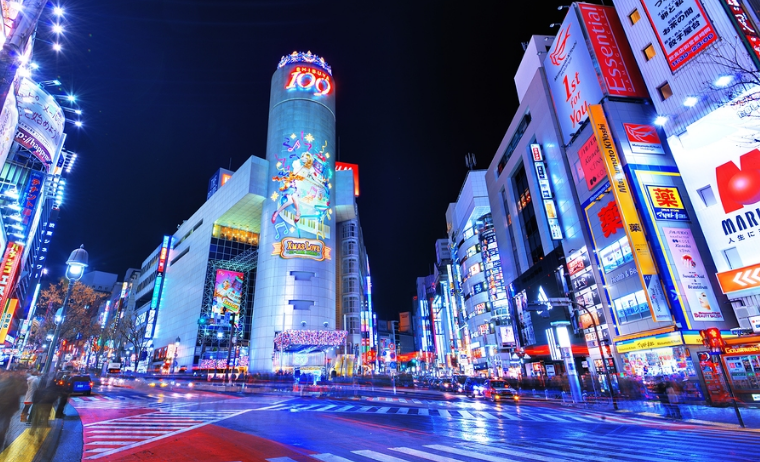 If you need help, Journy Concierge can plan your entire trip in Japan. We can help you find a hotel (and ryokans / onsens in Kyoto and Hakone), and give you an itinerary with full daily activities, restaurant reservations, and activities booked for you. Head over to www.gojourny.com to submit your request today. If you're heading to more than one city, just submit one request for your full dates and your concierge will get the specifics over email.